Description: No Silversmithing experience is required. This class isfor beginners or a refresher for everyone, please be prepared to focus and work hard. 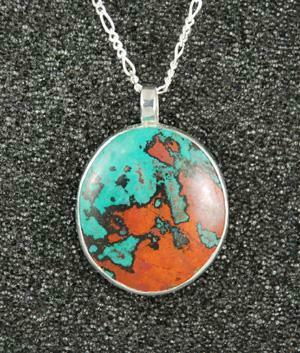 Students will make 1 bezel set stone pendant with a bail.Students will need to supply 1 small-to-medium cabochon. Students may bring personal tools if desired. Cabochons may also be purchased at class. Please contact the instructor with any questions. Students who have already taken this class can work on a more advanced project of their choice in silversmithing. Please sign up BEFORE February 3rdst so your materials can be ordered. Your place will be reserved when you contact the instructor and receive a reply. If you cancel after the date above or "no show" you will still be responsible to purchase your kit.